I’m obsessed with the phrase: “smothered in gravy”. 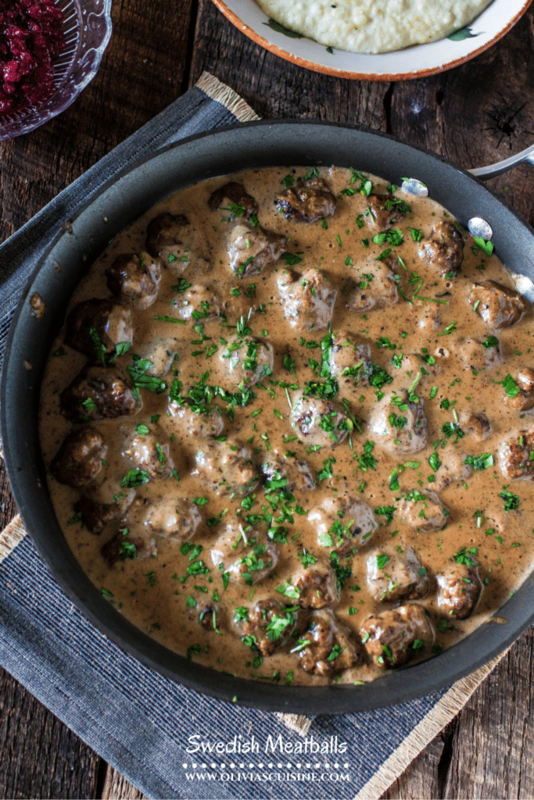 These Swedish Meatballs are reeeally smothered in a rich and creamy gravy. They are so delicious and so much better than the IKEA version that (we all hate to admit) we love eating when we go furniture shopping! Just this week I already made this recipe twice and almost had to make it a third time. Nothing wrong with the first attempt. It’s just that it’s SO HARD to resist it! The first time, as the meatballs finished cooking in the gravy, I took one to see if they were cooked through and oh my God! I was immediately hooked. I started eating them non-stop and then it was too late and I didn’t have enough to photograph. So I was like… “Oh well, I guess I’ll have to make them again tomorrow!”, and texted my husband all the ingredients he would have to get after work. The next day I make the meatballs and I strongly resist the urge to eat them all again. Then I leave to go to work and when I get home, Tim had eaten 5, even though I specifically told him I would have to shoot them first. Good thing it was only 5 and I was still able to photograph that batch, or I would be now making my 3rd batch of Swedish meatballs in the period of one week! Woof! Talk about meatball love, huh? 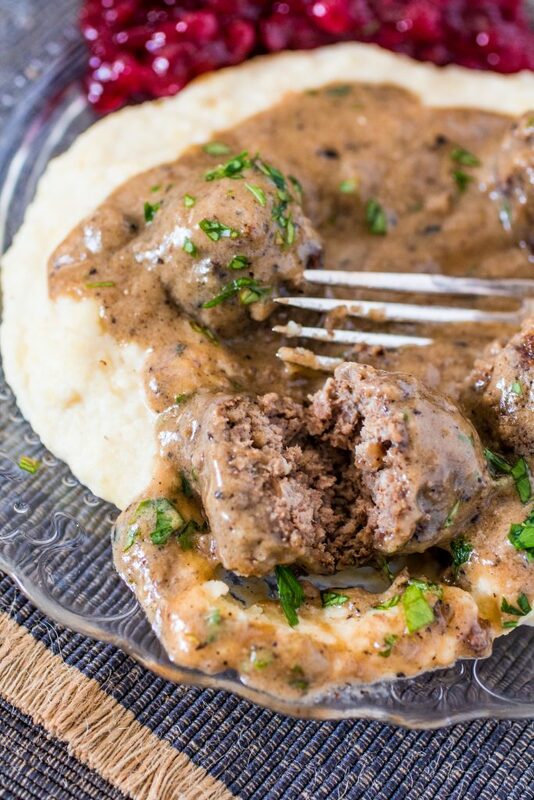 But, honestly, these meatballs definitely make the list “Food I could eat every day for the rest of my life!”. And as I write this, my mouth is already salivating and I’m so glad I’m gonna have meatballs for dinner. He’s probably scared to eat them after I got mad at him yesterday! LOL It’s worth the wait though… Today we will have the meatballs over mashed potatoes and with some lingonberry jam, that I got from IKEA, on the side. You can definitely make your own lingonberry jam/sauce or just substitutes for cranberry sauce! Like the one we eat for Thanksgiving, ya know? Or you can just eat the meatballs over pasta. Or rice. In a small bowl, mix the bread cubes and the milk and let it sit for a few minutes so the bread can soak the milk. Using a fork, mash the bread/milk mixture until smooth. Reserve. In a large sauté pan, over medium high heat, add 1 tablespoon olive oil and one tablespoon butter. Once the butter melts, add the onion and sauté until it begins to brown, about 2 minutes. Transfer the onions to the bowl with the bread/milk mixture and mix with a spoon or fork until incorporated. In a large bowl, combine the onion/bread/milk mixture, the ground beef, the allspice, the nutmeg, the eggs and salt and pepper to taste. Using your hands, mix everything together until you have a cohesive meat dough. Form about 50 small meatballs (about 1 inch thick), placing them on a plate. Heat 1 tablespoon olive oil and 4 tablespoons butter, over medium heat, on that same large sauté pan you used for the onions. Working in batches, brown the meatballs on all sides. Make sure you are gentle and that the pan is not too hot (control the heat, lowering if necessary), or they will stick to the bottom and fall apart! Reserve the meatballs on a separate plate so you can start working on the gravy. If the butter burns, discard and add 4 new tablespoons. If not, you can just use the same butter to make the roux. Once the butter is melted, slowly whisk in the flour, until smooth. Continue cooking until the mixture is a dark brown color. Start adding the beef broth, slowly, whisking constantly, until the sauce is smooth and silky. Return the meatballs to the pan, cover and lower the heat to a simmer. Simmer for 15 to 20 minutes or until the meatballs are cooked through. Transfer the meatballs, without the sauce, to a serving dish. Add the sour cream to the brown sauce, whisking until you achieve a smooth creamy gravy. Taste for seasoning and adjust salt and pepper, if necessary. 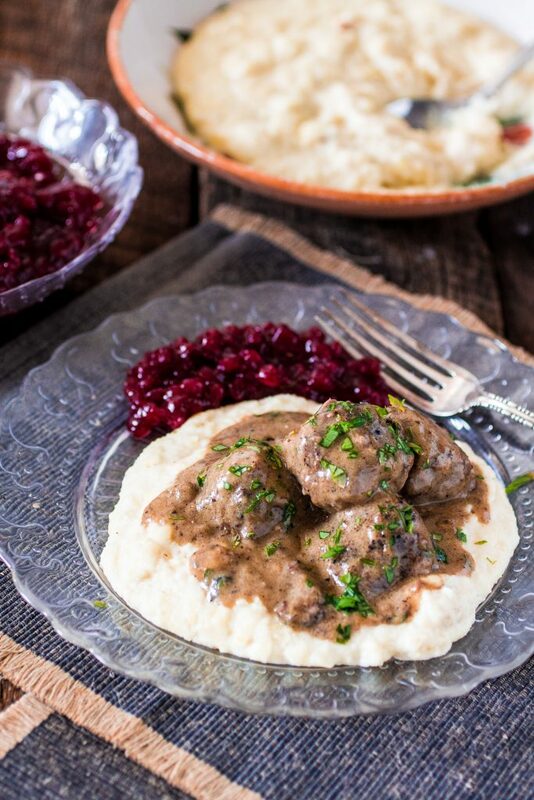 Pour the gravy over the meatballs and serve with mashed potatoes and lingonberry jam! P.S. Wanna keep in touch? Follow me on Facebook, Twitter, Instagram or Pinterest to stay up to date with my posts! If you end up making one of my recipes, I would love to see it! Just take a photo and post it on your preferred Social Media and tag me or use the hashtag #oliviascuisine! 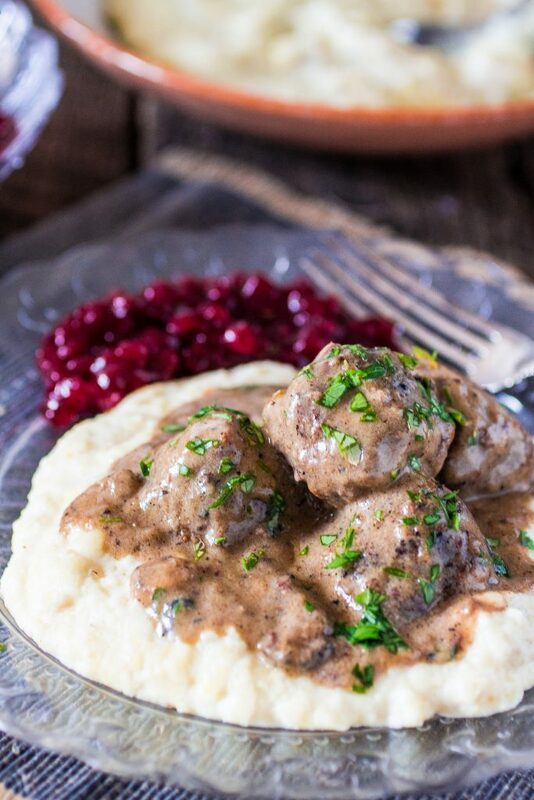 Meatballs of any kind are my weakness… especially Swedish meatballs. I TOTALLY understand and relate to the “oh well, I’ll just make more” mentality! 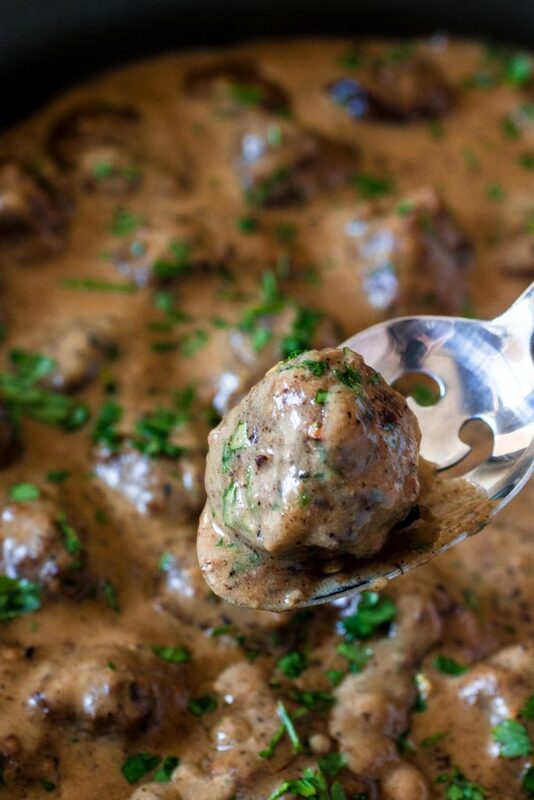 ;) #FoodbloggerProblems your Swedish meatballs look delicious! And heck yes to smothering everything with gravy!!! Cheers, lovely! A family favorite around here! Your version sounds delicious, can’t wait to try it! This dish is just what I LOVE. Hearty and comforting saucy foods are what I am craving at the moment. Delicious! This looks like the mother of all comfort foods. Yum! I might be the only person who never has eaten the Swedish meatballs at Ikea. No worries…this recipe looks crazy good! Pinning it to try soon! This looks like the perfect fall comfort food dinner. I love the meatballs at Ikea but homemade is so much better! It has been a long time since I have had a great meatball dish….reminds me of childhood. Oh, that gravy! Those colors! Such a plate of beauty. meatballs and gravy? I’m in!!!! Okay, I’ll admit it too – I love the Ikea ones but these look a million times better!! I need to make these – they look like the perfect fall dish! Yum! These meatballs looks AMAZING – my husband and kids all love meatballs. Will definitely be trying this recipe for them soon! This reminds me of the Ikea ones, love it and definitely this will be much better!